OpenNTF - Congratulations, Paul Withers! 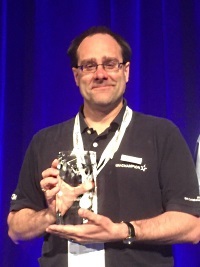 With great pleasure, the OpenNTF board likes to announce the latest achievement of one of our board members, Paul Withers, who was awarded the IBM Lifetime Champion on last Sunday at the IBM Think conference in Las Vegas! Paul does a great job over the years in the community being one of the core members of OpenNTF, the Extlib and ODA developer tribe and a frequent and reliable creator of highly valuable blog posts regarding all things ICS, XPages, Java and technology overall. "The IBM Champion Lifetime Achievement award recognizes an IBM Champion who stands above their peers for service to the community. Over multiple years, these IBM Champions consistently excel and positively impact the community. They lead by example, are passionate about sharing knowledge, and provide constructive feedback to IBM. The Lifetime Achievement award provides automatic re-nomination into the IBM Champion program for the duration of the program, plus other benefits." Congrats again to you all - keep up the good work!